Cut washed potatoes in quarters, cover with cold water in the pot and bring to a boil. Add 1 Tbsp of salt and boil for 12-15 minutes until tender. Don't overcook, drain and sat aside. While potatoes are cooking, cut 6 strips of bacon in half lengthwise, than crosswise into 1/2" pieces. Cook them over medium heat, until cooked but not crispy. Drain on paper towels and save bacon fat for later. Place potatoes cut side down in the baking dish, coated with reserved bacon fat. Sprinkle with 1/2 tsp salt and 1/4 tsp pepper. Bake at 425˚F until golden orange on the bottom, 35-40 minutes. Reduce temperature to 375˚F, remove potatoes from the oven and flip them over. Sprinkle with 1/2 cup Parmesan cheese, bacon, chopped garlic and drizzle with rest of the bacon fat. Bake for additional 15 minutes, or until cheese melts. 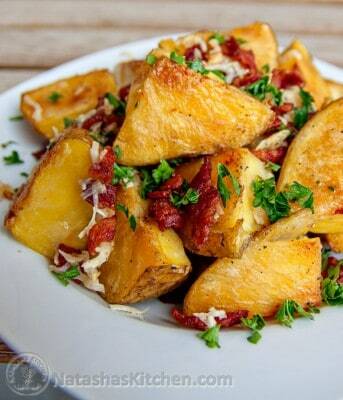 Remove baked potatoes from the oven, sprinkle with chopped parsley and serve right away.